My husband and I both love to travel. In fact, we tend to do a LOT of traveling every year. I should probably write a blog on traveling, we have been to sooo many places! The reason I don’t write a blog on travel? Hello! Look at the way I write? Besides, I would rather show you pretty pictures to make up for my lack of writing skill. 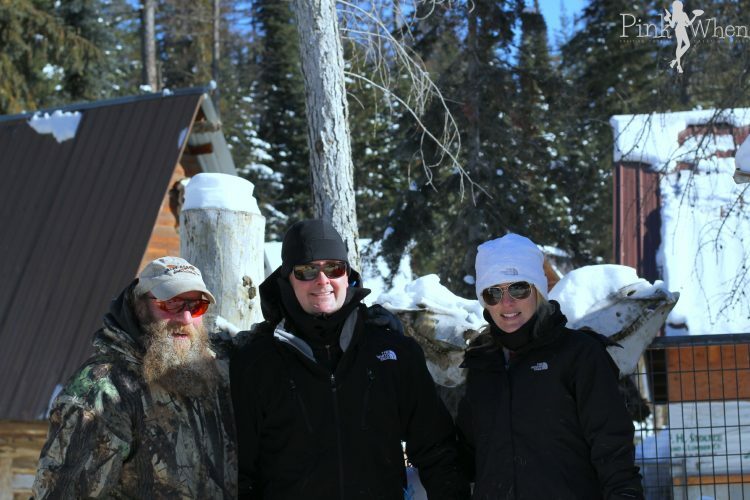 Here is a quick little post sharing all of our adventures with Snow, Ski, Sled, and Whitefish, MT. 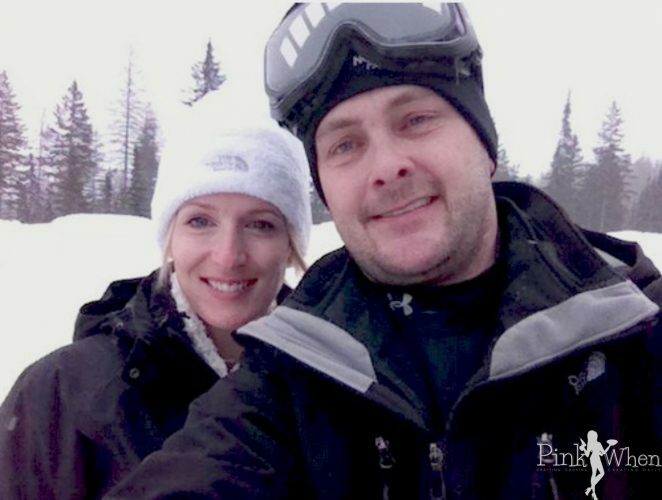 Snow, Ski, Sled, and Whitefish, MT. Here is the beautiful Big Mountain and the view that was right outside of out window. 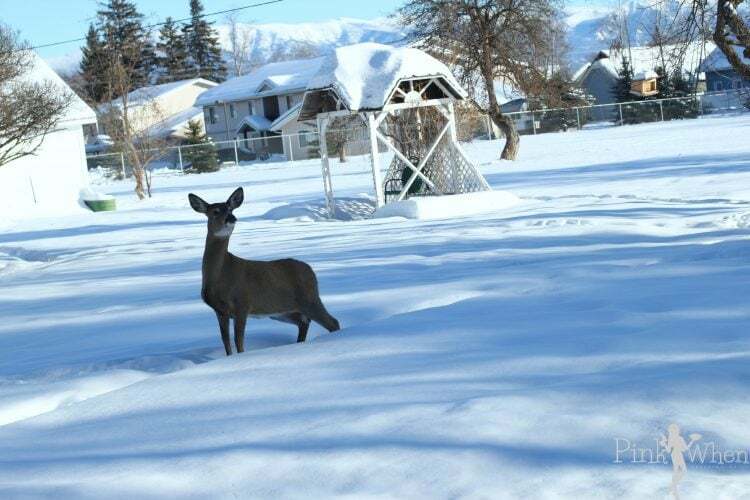 Deer and Elk are all over the place, and it was nothing to see them grazing and roaming throughout the town. After our Ski trip to Telluride last month, I just had to go and try it one more time. I had a lesson with a handsome gentleman named Alex who was from Transylvania, Romania. He was such an awesome teacher, but I really just liked to listen to him talk! Below is a picture of my husband and myself on our first day. it was pouring snow and really just a perfect day for skiing. Here is a video that one of my husband’s friends took while they were skiing. His pictures and view are much better than any of my slow skiing! 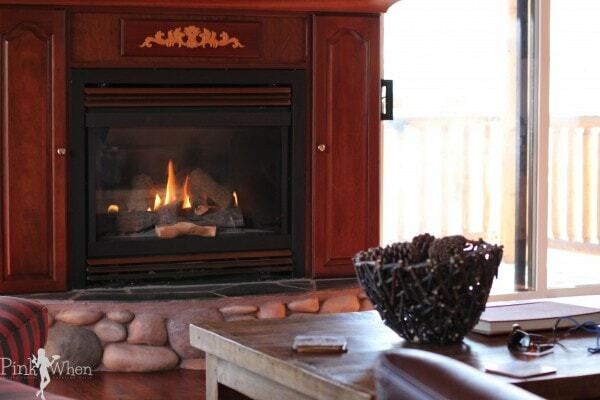 When it was time to warm up, we stayed inside and kept the fires going. It was beautiful in Whitefish inside, or out. While indoors was warm, the outside was full of adventure! We were told numerous times how much fun Dog sledding could be. Jeff and his group were so wonderful, and he really is such an animal lover. All of the dogs he trains are strays and rescues from shelters. Just as my lab Ranger lives for playing ball, these babies all live for their turn to run the sleds. If you are ever in Whitefish, you should totally click the link above and look them up. Tell him that the Louisiana couple sent you! His babies also eat better than I do! They don’t get dog food, but they get fresh salmon and chicken for meals. YUM! 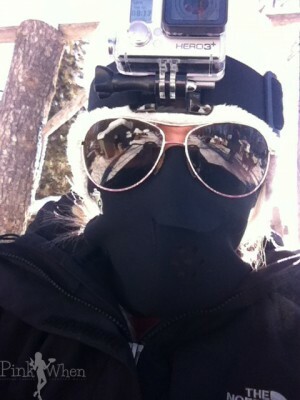 You had to dress warm for this adventure….and any other adventure outside! The picture below is basically what I looked like the entire trip. Well…I didn’t have the camera on my head the ENTIRE time. Want to see how much fun dog sledding can be? Check out this fun little video below. While this guy below didn’t run that day, I had to take a picture of him. Look at those eyes. They are so light blue, they are almost white. He is so beautiful! After our day of sledding, we ate at a phenomenal restaurant called Kandahar Cafe. Not only was the food delicious, but the chef was trained in Baton Rouge, La. Needless to say, I highly recommend the 7 course Chef’s Table menu. It was phenomenal! You could do a wine pairing with each of the servings, but they had one of my favorite brands available. 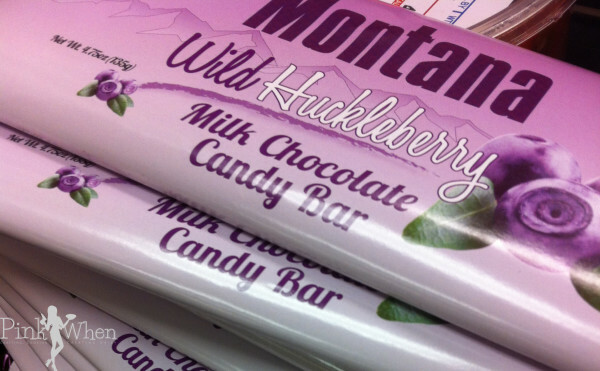 Not only did I fall in love with this wine, but I also fell in love with this Wild Huckleberry Milk Chocolate candy bar! I seriously bought every single one I could find before I left town. Seriously, YUM! We had such a wonderful time in Whitefish, MT. While I thoroughly enjoyed our visit in the winter, I am really looking forward to returning again during the summer one year. All of the locals said that July was the best time of the year for hiking, camping, fishing, and exploring beautiful Whitefish. Not to mention, I want to go pick some fresh Huckleberries! Anyway, I hope you enjoyed my little recap of Ski, Snow, Sled, and Whitefish, MT. Now back to our regularly scheduled program…. WOW! The videos! Unreal. I didn’t even get motion sick watching them, and I usually do. We went dog sledding in Vermont a day before a blizzard. And it was night time! It was wild. 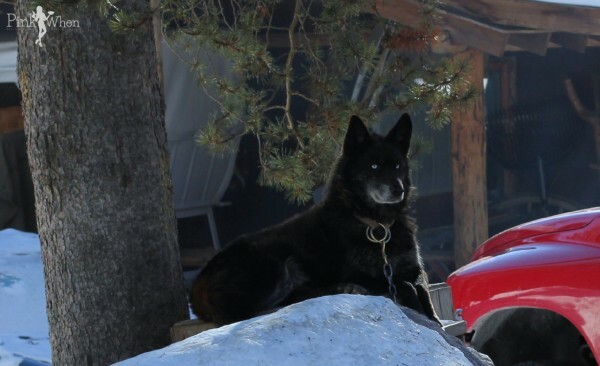 I’ll never forget the sounds of the dogs and the way the sled would dip up on snow banks, but we always felt safe. This is like another planet! And get me some of that wine and chocolate! 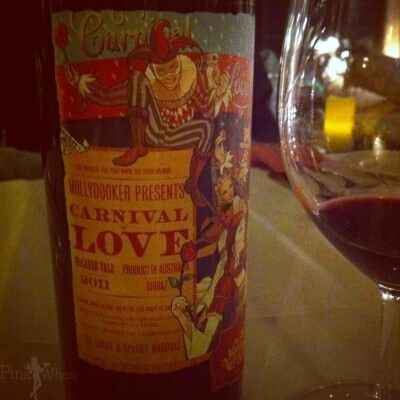 Everything we did was fun….but my favorite things were the wine and chocolate! That dog sledding video was awesome!! I am always amazed by that! And that chocolate sounds delicious! 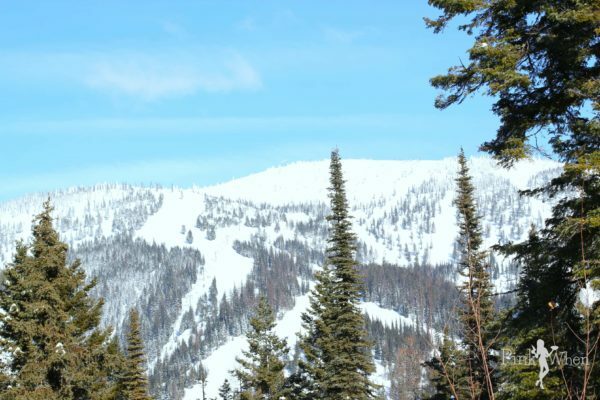 I’d love to go skiing in Montana one day. I grew up in Colorado but didn’t learn to ski till I was an adult, so I’ve actually only skiied out West a couple of times. What an awesome trip! You really do have a lot of fun adventures! Next stop Vegas!